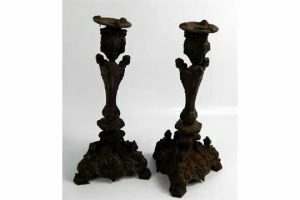 A pair of 19th century French bronze Renaissance style candlesticks, each with a triform base cast with mythical figures. 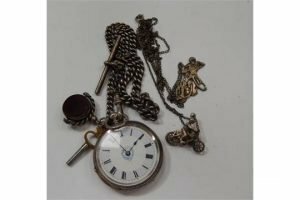 A Victorian silver fob watch, with enamel dial and Roman numerals, the case dated Birmingham 1882, and a silver Albert watch chain with spinner fob set with agates, with a thin chain necklet with two charms. 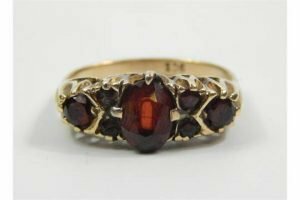 A 9ct gold and garnet three stone ring, interspersed with two pairs of tiny garnets. 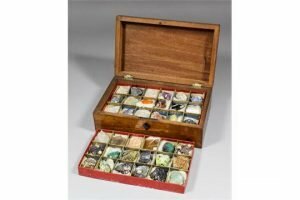 A late Victorian collection of sixty mineral specimens, with description and area of collection, contained in a mahogany box with three drop-in sectional card trays. 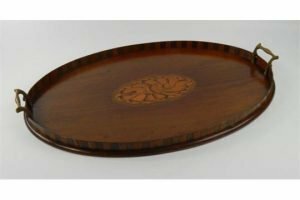 An Edwardian Sheraton revival oval mahogany and inlaid tray, with marquetry shell on hare wood ground, cross banded gallery, with two brass handles. 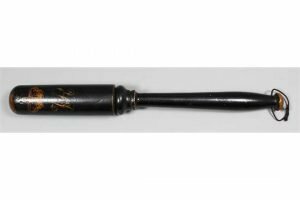 A mid Victorian turned wood truncheon, painted with a crown over the “VR” cipher on a black ground. 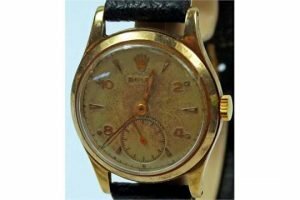 A 1950’s 9 carat gold gentleman’s Rolex wristwatch, with matt cream dial, Arabic numerals and triangular markers, with minute track having second subsidiary dial to 6 o’clock with gilt arrow hands, on strap with additional Rolex yellow metal buckle marked 9ct. 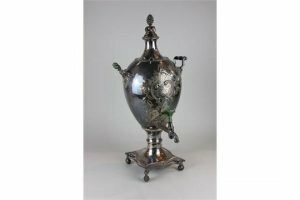 An 18th century Sheffield silver plated samovar, with embossed floral and scroll cartouche, monogrammed, with green stained bone handles on square base. 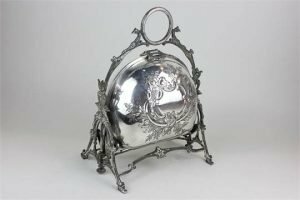 An early 20th century silver plated biscuit box, with embossed floral scroll detail, the two sides opening with pierced dividers. 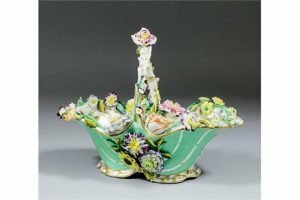 A 19th Century Coalport porcelain oval basket, with a high handle and encrusted with flowers, on a green and gilt ground. 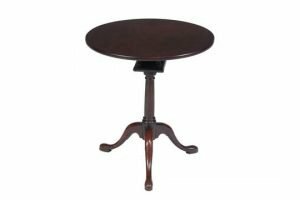 A George II mahogany occasional table, circa 1750, the circular tilt top above birdcage, turned pillar and tripod base. 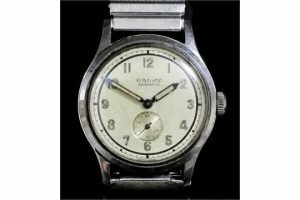 A mid 20th Century gentleman’s stainless steel Baume wristwatch, the silvered dial with Arabic numerals and subsidiary seconds dial, contained in a plain 34mm case. 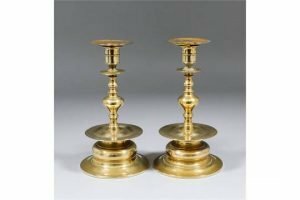 A pair of late 19th Century Swedish brass candlesticks of 16th Century design, by Gusums Bruk. 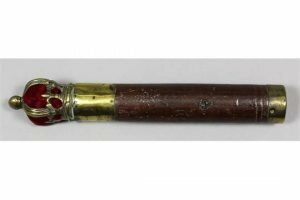 A 19th Century tipstaff surmounted by a brass crown with red velvet infill, mahogany handle and brass ring end, 6.5ins. 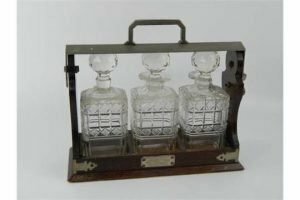 An Edwardian oak tantalus, with three pressed glass decanters, 30cm high including handle. 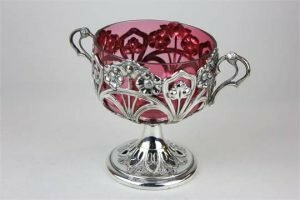 An Art Nouveau silver plated pedestal bowl, with cranberry glass liner and floral embossed detail. 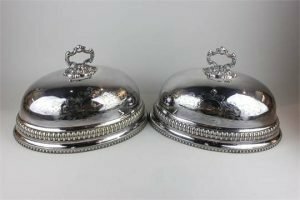 A pair of silver plated domed shaped oval covers, with engraved decoration and gadroon border 35cm. 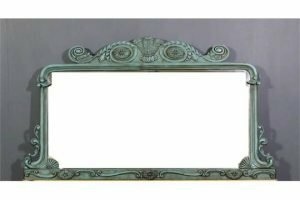 A green painted overmantel mirror, the shaped cresting moulded with “Prince of Wales Feathers” and oval leaf paterae, the sides with open leaf scroll ornament and the frieze with applied oval leaf paterae. 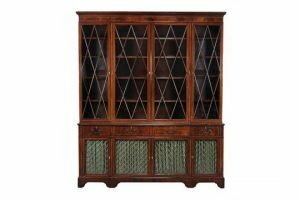 A mahogany and inlaid library bookcase, in George III style, early 20th century, the moulded cornice above four astragal glazed doors opening to adjustable shelves, the lower section with drawers above four brass grille panelled cupboard doors, on bracket feet. 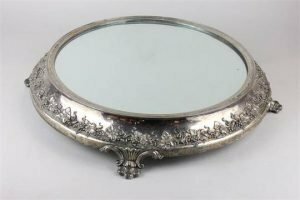 A Victorian silver plated table stand with circular mirrored top, sloping border decorated with fruiting vines, raised on four shell feet.